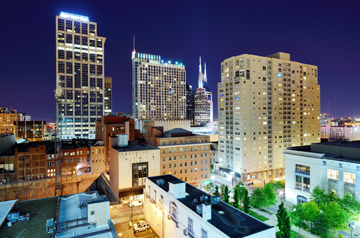 Known simply as “The District,” downtown Nashville’s favorite areas are Printer’s Alley, 2nd Avenue, and Lower Broadway. Loft space and upscale condos line the streets of downtown. Prices for this coveted location can start as low as $200,000 and the sky is the limit for the luxury condos with views of the city and the Cumberland River. From unique shops to honky tonk bars to a newly renovated public library that feels more like a museum, the downtown area provides plenty of variety. The historic Ryman Auditorium is a music venue where every artist dreams of performing. It used to house the Grand Ole Opry, which still comes back to its roots every so often. Other cultural staples in this area include the Frist Center for the Visual Arts and the gorgeous Schermerhorn Symphony Center. LP Field, home of the Tennessee Titans, is another of Nashville’s major downtown attractions. Cool high-rise condos and urban-chic lofts with stunning views mixed in beside and above upscale offices, shops, restaurants, bars, and coffee shops define Nashville’s newest hotspot, The Gulch. As a business district as well as residential area, its prime location between downtown, West End, Hillsboro Village, and Music Row makes it a thriving community. This is the first LEED-certified neighborhood in the South and only the 13th in the world, so those looking for a green lifestyle will love it here! Some of Nashville’s newest and most popular restaurants and bars reside in The Gulch. Executive chef James Lohse of ultra-modern Watermark keeps his menu changing with the seasons to highlight the best food for each time of year. Next door, Sambuca boasts live music, European-inspired décor, and a beautiful porch overlooking the Gulch district. Across the street is arguably the best tequila menu in town at Cantina Laredo, serving an extensive list of gourmet Mexican food. Learn more about the Gulch Neighborhood and its Real Estate Market here.